A classic dessert made with pureed fruit and sweetened heavy cream. 1. In a blender, add blackberries, sugar, and lemon juice. Blend until smooth. Pour mixture through a fine-mesh sieve. 2. Press with a rubber spatula to push through. Discard seeds and transfer 1/2 cup blackberry puree to a small bowl. Cover and refrigerator; reserve for topping. 3. In a large bowl, combine vanilla essence and cream; whip until stiff peaks form. Gently fold remaining berry puree into cream. 4. Gently fold remaining berry puree into cream. Combine well. Spoon mixture into custard cups. Cover loosely and refrigerate 1 hour (or up to overnight). Now, Blackberry Fool is ready! Serve. Drizzle blackberry fools with reserved berry puree, and garnish with blackberries. 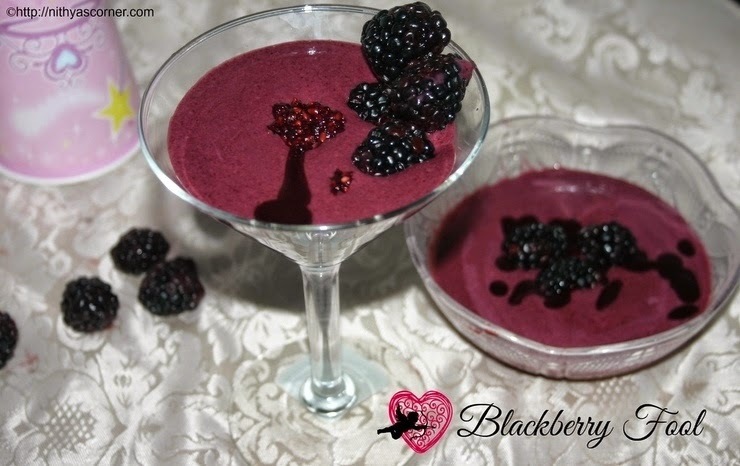 This entry was posted in INTERNATIONAL RECIPES and tagged Blackberry, heavy cream, lemon juice, Martha Stewart Ingredients Blackberries, Pure vanilla extract on November 22, 2014 by vikashbhardwaz. Sambal is a perfect and spicy Indonesian dish that goes well with Rice. You can make Sambal with a lot of vegetables, meat, and seafood. Some of them are Brinjal, Small Potato, Cucumber, Pineapple etc. My maternal grandmother makes Fish Sambal so well. The dish is usually made using red chillies, garlic and small onions. If you want the Sambal to be less spicy, add less red chillies. Gj is not a lover of spicy foods, so I made this Sambal using less red chillies. You can have a teaspoon of this Brinjal Sambal with a cup of boiled rice. You will find it less spicy. It is definitely a dish that is worth trying but not recommended for kids. Spice lovers, you are going to love this recipe! Small onion/shallots – 10 nos. 1. Soak red chillies in water for about 10 minutes. Grind red chillies, small onions, and garlic cloves to a fine paste. 2. Again add a tablespoon of oil and then grind again. The paste would be smooth. Now heat oil to deep fry the brinjal pieces. 3. Cut the brinjals vertically into thin slices. Now deep fry the brinjal pieces until they are almost cooked. 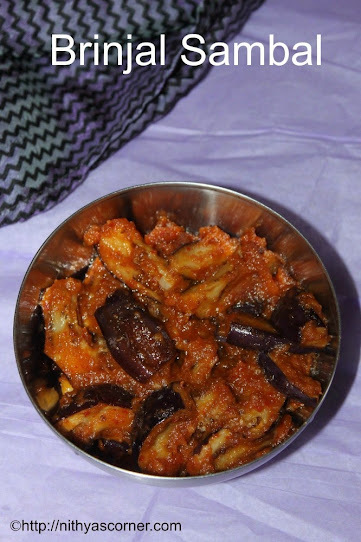 If you are planning to deep fry the brinjal pieces later, then soak them in water. Also wipe them in a tissue paper before deep frying them. 4. Keep the deep fried brinjal in a plate. In a wide-bottomed pan, heat 2 tablespoon of oil and add the ground paste. Add salt and little water. Cook until the raw smell disappears. 5. Add the fried brinjal pieces and stir well. Now, Brinjal Sambal is ready! 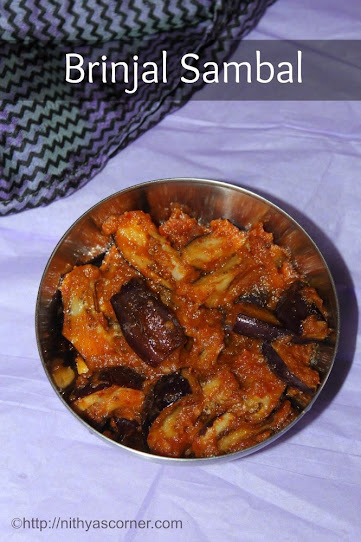 This entry was posted in INTERNATIONAL RECIPES and tagged Brinjal Sambal, Fish Sambal, Red chillies, Sambal on November 22, 2014 by vikashbhardwaz. Bruschetta is a very simple Italian appetizer. It is very healthy and can be prepared in minutes. Baguette or French Bread – 1 no. Garlic cloves (Poondu pal) – 4 or 5 nos. 1. Boil water in a vessel and add the tomatoes. When the skin of the tomatoes comes off or cracks, drain the water and let it cool down. You could also grill the tomatoes. Its skin will wilt and get burnt. Then, you can peel its skin. 2. Using a sharp knife, peel the skin of tomatoes and dice them into 1/4″ cubes. Remove its seeds. Add in the extra virgin olive oil, salt, ground black pepper, chopped onions, chopped garlic, and chopped basil leaves. Mix well. If the tomatoes are hot, be careful while peeling the skin of the tomatoes. If you do not like raw onions, then either microwave it for 2 mins or just lightly saute it in a pan with a teaspoon of oil. The taste would slightly differ. If you are not in a hurry, you can let the tomato mixture sit in the refrigerator for 30 minutes. 3. Slice the bread diagonally into 1/2 inch thick slices. Brush one side of the bread with olive oil. 4. Heat a griddle/pan and toast the bread. Once the bread is toasted, remove it from the pan. Then, rub one side of the toasted bread using slices of raw garlic just to impart garlic flavor onto the bread. You can toast the bread using a bread toaster or using coal or broiler or oven (450F or 200C). If you toast the bread in oven, place the bread with oil side down. Place it on the top rack of the oven. It takes 5 to 6 minutes and toast till the bread becomes crispy and its edges golden brown. 5. Now, arrange the bread in a serving plate with olive oil side up. Place one spoon of tomato mixture on each slice of the toasted bread and serve. If you are planning to serve this dish later, then store the tomato mixture in an airtight container. Place the tomato mixture on the bread slices at the time of serving or else the bread would become soggy and not taste good. 1. Why do they use Plum/Roma tomatoes instead of regular ones? Plum/Roma tomatoes have very little watery juice, few seeds, and have thicker skin when compared to other tomatoes. Plum/Roma tomatoes will not make the bread soggy. 2. What if I do not have Plum/Roma tomatoes at home? You can use tomatoes that you have on hand in your kitchen. Bruschetta will taste good even without Plum/Roma tomatoes. 3. What if I don’t have Baguette bread/French bread? You can use any French bread and follow the same procedure. This entry was posted in INTERNATIONAL RECIPES and tagged Baguette, Bruschetta, French bread, Roma, tomato mixture on November 22, 2014 by vikashbhardwaz. I love this Goreng Pisang so much and my mom makes it often. When it comes to food, I used to be very fussy during my childhood days. I would eat very few dishes, and this dish is one among them. My mom makes it for me when she feels that she had to appreciate me for something I did or when it rains heavily in Pondicherry. Nowadays, I have it along with a cup of masala tea. Goreng Pisang brings nostalgic memories to my mom who had settled down in India. She often tells me that her mom, my grandmother, makes it often for her when my mom comes home from school. All my uncles and aunts used to chat and eat Goreng Pisang together it seems. My mom said that many small scale restaurants have this in their menu card in Johor Bahru. My mom and myself just adore this dish so much. Who is going to join us very soon? 1. In a large mixing bowl, combine all the ingredients except bananas and water. Now add water little by little and make a smooth and lump-free batter. Stir well so that the sugar blends well. 2. The consistency of the batter should be quite thick as shown in the pictures below. 3. Heat oil for deep frying the bananas. 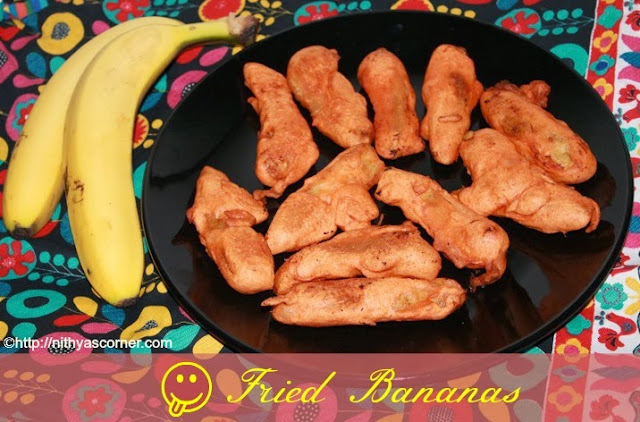 Dip the banana pieces into the batter till evenly coated and deep-fry it in batches of 5 to 6. 4. Fry the bananas until golden brown on all sides and drain on paper towels. Now, Goreng Pisang is ready! Serve. You can eat it as such or with Vanilla Icecream. Serve immediately. Bananas should be ripe but not too soft. You can also sprinkle powdered sugar on top. 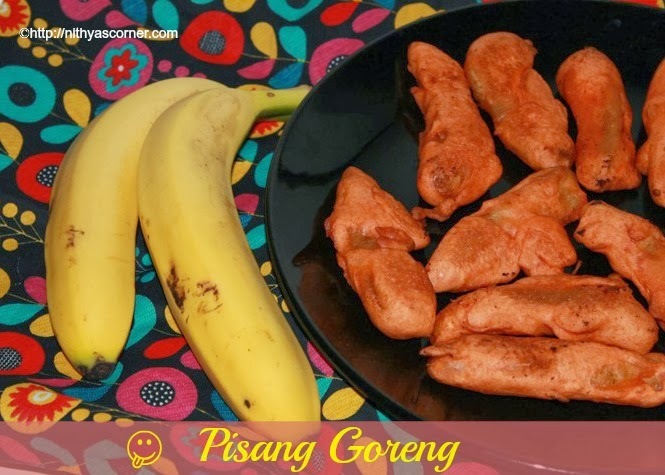 This entry was posted in INTERNATIONAL RECIPES and tagged Goreng Pisang, Recipe Category on November 22, 2014 by vikashbhardwaz. This entry was posted in INTERNATIONAL RECIPES and tagged Hot Coffee, Japanese Dance, Japanese food, sesame seeds on November 22, 2014 by vikashbhardwaz. 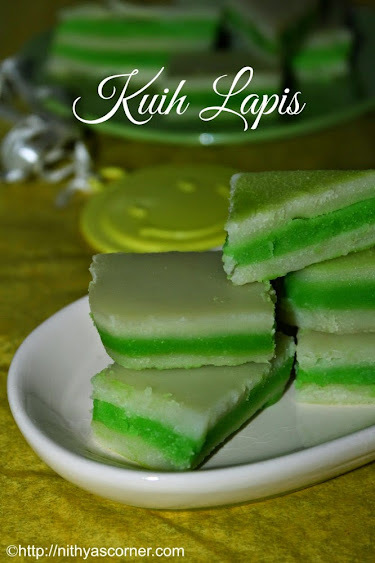 Kuih Lapis is my mom’s favorite sweet. I like the flavor of the sweet so much. You can play a lot with the colors of this sweet. 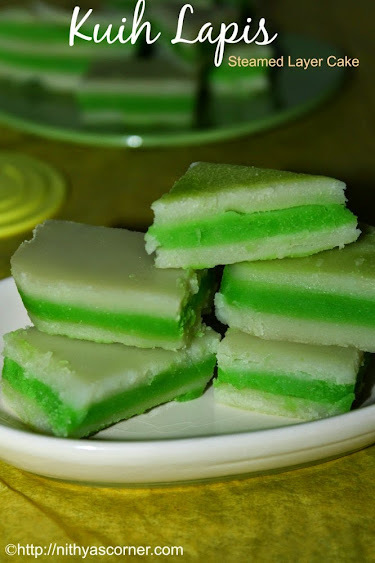 Usually, this sweet is made with Pandan (screwpine) leaves. 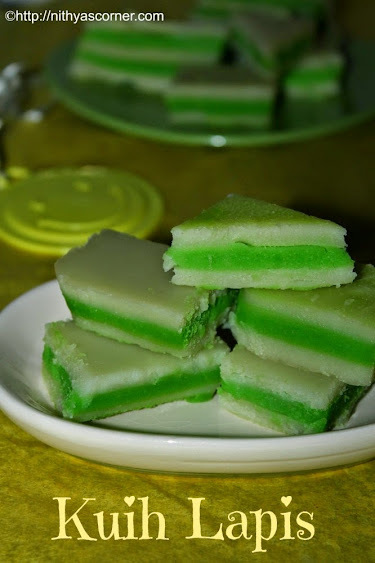 The pandan leaves not only gives green color to the sweet but also an aromatic flavor. 1. In a mixing bowl, add tapioca flour, sugar, and corn flour. 2. Now add rice flour, vanilla essence, egg, salt, and coconut milk. 3. Add water and combine the ingredients well. Now divide the batter into two: I used two colors – green and white. In the first batter, I did not add food color because I wanted a white layer. In the second batter, add the green food color. 4. Stir well such that the food color blends well. Grease the container (in which you are going to set the sweet) using few drops of oil. Add the white batter in the container (I wanted the bottom layer to be white). Heat the container over boiling water and a high heat. Steam over a high heat for 3 to 4 minutes until cooked through. 5. Now add the green batter on top of the white layer, and make sure you stir the batter well each time before pouring into the pan. Steam over a high heat for 3 to 4 minutes until cooked through. Repeat the layering as desired. Again, I added the white layer on top of the green layer and then steamed for 4 more minutes by covering the tin. Leave the steamed cake to cool completely (otherwise it will collapse), before cutting into slices. 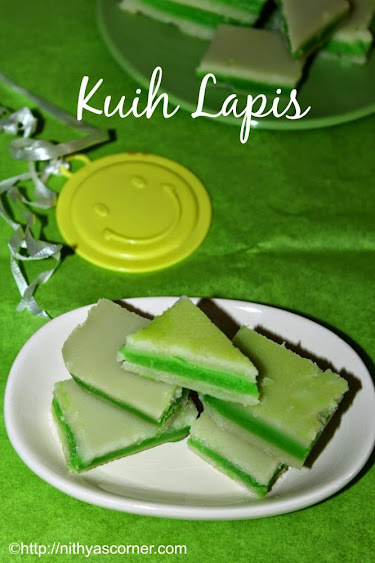 Now, Kuih Lapis is ready! While steaming, make sure you have enough water. You can refrigerate it for 1 week. Once the first layer is cooked well, add the second layer. Cool down the cake completely before slicing it. This entry was posted in INTERNATIONAL RECIPES on November 22, 2014 by vikashbhardwaz.